Experiments to reverse low community college completion rates by redesigning the remedial math most students must take are yielding promising results, defying assumptions about the kind of math students really need. 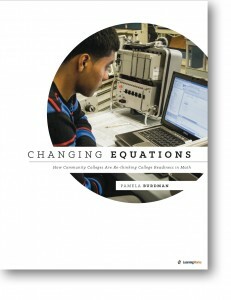 Changing Equations highlights a new movement in a growing number of the nation’s community colleges to prioritize statistics and quantitative reasoning, a major departure from the traditional one-size-fits-all remedial math sequence that emphasizes intermediate algebra. Early results – including a dramatic jump from 6 to 51 percent in the proportion of students completing college-level math in their first year of college — are lending credence to the theory that the alternative pathways are better tailored to academic majors that don’t require intermediate algebra. About a quarter of California’s 112 community colleges, as well as numerous colleges in at least a dozen other states, have begun to develop these alternatives for non-STEM (science, technology, engineer, and math) students. The alternative math pathways supplement other remedial math reforms that colleges and college systems have been pursuing for several years – including changes to instructional practices as well as placement policies. This brief was written for LearningWorks by Pamela Burdman, a nationally recognized education policy analyst, philanthropy professional, and journalist. It is about time things change. Students will be a lot happier taking courses that enrich their major, than one-size-fits-all remediation. I still pine for the days when secondary education required Latin, Greek and civics. Just kidding.